After over 150 years of extirpation in Santa Clara Valley, a family of California Golden Beavers have inhabited a stretch of the Guadalupe River in Downtown San Jose, California. It is believed that the beavers came down the Los Gatos Creek from Lexington Reservoir, high in the Santa Cruz Mountains, where the Beavers were reintroduced in the early 1990’s. As more Beavers are born in the mountains they begin to disperse north, further down the water shed towards the San Francisco Bay. An extensive flood control project in the downtown area, narrow riparian setbacks, low amounts of native vegetation, and human constructed dam barriers have kept the beavers in the mountain reaches of the upper Los Gatos Creek, until recently. Late in March of 2013, Roger Castillo, Citizen Ecologist and founder of Salmon and Steelhead Restoration Group, sent photos of two recently chewed Willow trees to a group of local conservationists. 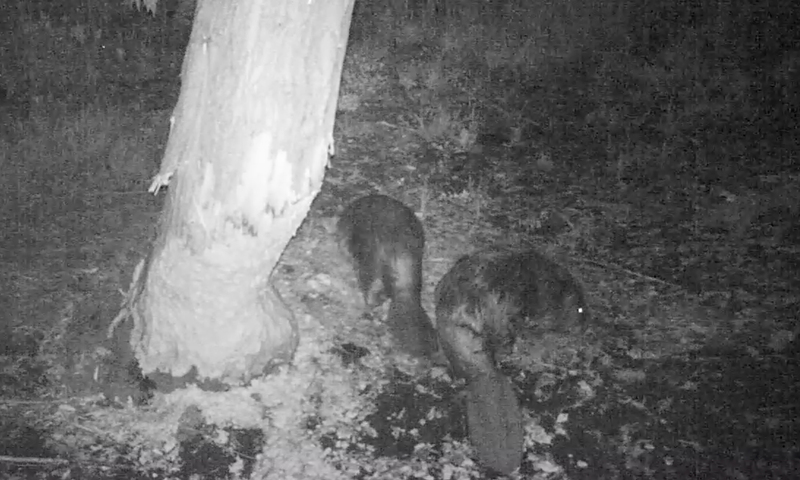 Urban Wildlife Research Project being one of the contacts, quickly responded by setting up two infrared cameras to catch the nocturnal mammals in action. After the first week of surveillance, hours of footage of three Beavers including two yearlings and a pregnant mother Beaver was captured. A study of the habitat reveals there is currently no dam building activity because the pond that they call home, is deep enough to support the Beaver family. As the year presses on, water levels will drop and the Beavers my decide to start construction. They are currently suspected to have a bank burrow, the entrance would be about three- feet under water, really hard to find. After viewing the footage there was one issue that arose among the Beaver Team of Conservationists. If the Beavers built a dam or destroyed native vegetation, they could be seen as a threat to achieving flood control mitigation and flow requirements. In turn, property owners along the river like: the Santa Clara Valley Water District(SCVWD) or the City of San Jose, might not see the beavers as the most welcome guests within the limits of the flood control project. Many Beavers all over North America are seen as flood risks instead of a Keystone Species, one who’s presence is a stronghold for the success of other species. Alas, Beavers are sometimes trapped and relocated or killed, families and dams destroyed because of lack of education on how to deal with the challenges Beavers give humans. But Beaver Conservationists have proven that any city or organization smarter than a Beaver can co-exist with the Beavers. The Conservationists set out make the public widely aware of the beavers and gather support for the simple solutions to beaver vs. human problems. They notified media, reached out to the public via social media and a change.org petition, and requested a meeting with the SCVWD. Richard Lanman-Adobe Creek Advocate and Beaver Expert proved the commonly thwarted notion that the Beaver was native to Santa Clara County. He backed this via early trading reports with Native Americans and the catalog of a 1855 Beaver specimen from Saratoga Creek housed in the Smithsonian National Museum of Natural History. He also stated “Beavers have beneficial effects to Salmonids, Endangered Red-legged Frogs and Western Pond Turtles.” These Beavers create a pond ecosystem which has been lost in our channelized Urban Streams. The Beavers future is still uncertain with the lower summer water levels approaching, we need to establish a public awareness of the treasures of our ecosystem. We have organized a petition via Change.org to build a support and fan base for our Urban Stream Beavers, please sign our petition and encourage others to do so as well. I saw you here w Rick (Lanman?) a month or so ago (Los Gatos Creek/Lexington Res.) — you’ve had a camera set-up here just recently; I’d really like to see what you got! …Hope you’ll pass along some video. any news on the beavers…walked the river in San Jose 1/1/16. No beavers only trash and homeless belongings.